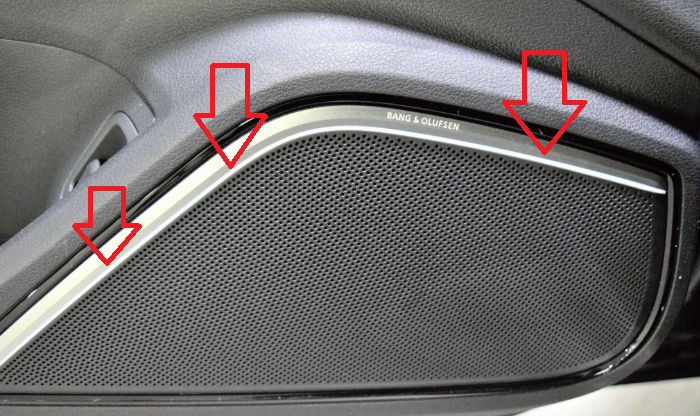 Fellas, tonight I've noticed the passenger side door trim where the Bang & Olufsen speaker is located, the white LED strip that just sits underneath the Bang & Olufsen logo is not working. How do I go by replacing this? I have taken door trims off in the past but not my S3. Is the other side working? Also why on earth would you want to fool with this? This is under warranty. Yeah, the driver side is working fine. Oh believe me, I rather not fool around with it! Unfortunately, warranty expired a couple of months ago. Called up my local Audi, they mentioned that the Ambient Lighting is part of the side door trim, it costs $1200~ AUD just for the trim - what a joke! I will get my local mechanic to take a look at it, unless someone has experienced this issue and willing to share their experience on how they got it fixed? The front grill and the fiber optic are part of the door panel. There's a LED module that a fiber optic conductor feeds the light through. I'd guess you either have a loose connector (easiest fix) or the LED module is bad. Thank-you for your thorough response mate, appreciate it. However, I've got it working now. Took the side trim apart and noticed that the cable was lose, re assembled it and works it's fine! Ha- that's the first time I've seen "loose" spelled "lose". There seems to be an epidemic the other way around! Any way, glad you got it working again.